Fun Fun is Spagna, Antonella Pepe, and Angela Parisio on vocals. An Italian disco project from Alvaro Ugolini and Dario Rainmondi and a non-stop dance floor hit machine from 1982 – 1987. “Living In Japan” is their single from the album “Have Fun!” – an electronic trip with romance in the land of the rising sun. One of the big hits for me during its release since the sound of Fun Fun is so recognizable and ‘fun’ to move with. This is also one of the sweetest of their vocal recordings and great kickin’ mid-tempo rhythms. I have taken scenes from the 1961 Toho Studios fantasy film, “Mothra” – centering in on the “Shobijin” twins who entertain us in this mild and short tribute to Fun Fun and also segments of the ritual for their god, Mothra. 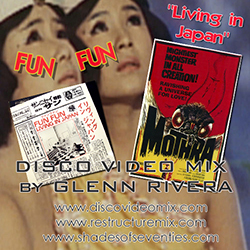 Featuring scenes from "Mothra" - RENT THE DVD!